breaches appearing with alarmingly increasing frequency. commercially available ransomware appeared. Now, budding cybercriminal "entrepreneurs"
stipend compared to the potential financial rewards. $6 trillion by 2021, which will make it the most profitable criminal enterprise in the world. illicit drugs – otherwise the first- and second-place record holders – combined. organization they protect and the outside world. defendable perimeter for print operations for organizations of all sizes. cybersecurity perimeter for every new device. and assesses users' access controls in real-time. Xerox ConnectKey is the solution to this problem. unless the attacker also obtains a supervisor access key. system, software application, or other higher-level function. the risk of cyberattacks at the firmware level. What About Ease of Installation? makes the task a moonshot at best. employee records from the moment the device turns on. Are you ready to implement a best-in-class cybersecurity solution for your company's print fleet? 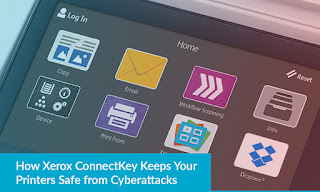 Contact QBSI-Xerox's print security specialists and learn more about Xerox Connectkey.